For five weeks, beginning with the last week of May, the mouth of the Merrimac River in Newburyport, MA is the easiest place to catch a keeper Striper that I've ever fished. 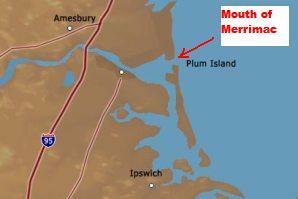 It is the northern tip of the seven mile stretch of Plum Island and the locals just call it "The Point". The structure created by a sandbar, combined with fast moving water and the magic of fresh water meeting the ocean, creates a fantastic feeding spot for hungry, migrating Stripers. The first spring that I fished there, 2004, I had more than one night where I caught ten plus keepers. 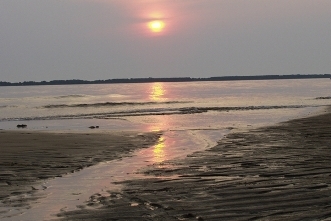 At sunset, every night during this period, surf anglers wade far into the shallow but fast moving water almost shoulder to shoulder. Most are drifting fresh clam meat on a circle hook with a sliding egg sinker. Quite a few also use weighted soft plastics. The current is strong and you need to get your offering out of the water before you cross over the line of the guy to your right. The best tide to fish this spot is the last two hours of the drop and the first two of the incoming. Although the Point doesn't give up many trophy Stripers, most years there are plenty of 26" to 34" fish to be had. I like to fish this spot at night, at the end of the dropping tide, with a black swimming plug, just when the water turns and starts moving right to left. To get there, find your way from I95 to Route 1A in Newbury. Turn on to Rolfes Lane toward the water. 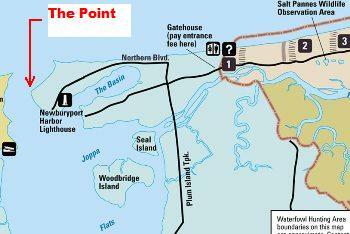 When Rolfes ends, turn right on Plum Island Tpk. and drive about 1.5 miles until you pass the Surfland tackle shop and then turn left on Northern Blvd. Follow it about a mile until you see a big parking lot on your right. There's a well marked path from the parking lot to the water. You'll see the guys lined up fishing in front of you. You're in the right spot if you look directly across the water to New Hampshire's Salisbury Beach. If you need bait or tackle or have any questions, stop at Surfland - Kay Moulton knows how to fish these waters better than any one on the planet.